A Hamlin Lake tradition since the 40's, the Wrens Roost was owned by the Scott family when it burned down in 1977. 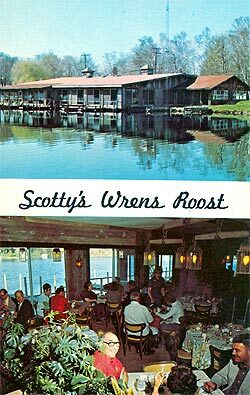 Dwight "Scotty" Scott bought the Wrens Roost Restaurant on Hamlin Lake in 1964. 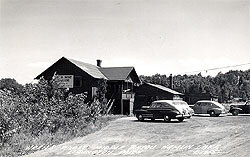 The Wrens Roost became a favorite restaurant for locals and Hamlin Lake tourists, made all the more popular by its waterfront views and parking for boats. Unfortunately, the Wrens Roost burned to the ground in 1977 and rebuilding the restaurant at the same location wasn't an option. Not to be deterred, Scott purchased the Swedish Coffee Pot on Ludington Avenue in 1977, renamed it "Scotty's" and it quickly became known as an exceptional steak and seafood restaurant. By the mid-70s, he had also purchased the TownHouse (now Michael's) in downtown Ludington. Scotty's tradition of casual fine dining continues to this day under the ownership and management of Scott's son, Richard. Adding a third generation, Richard's son, Chip, also shares in the operation of the restaurant. Scotty's is popular for prime rib, steaks, lobster, salads, and sandwiches. They also serve cocktails and a tasty Sunday Brunch. Richard Scott is also the owner of PM Steamers, located on the waterfront across from the Ludington City Marina. PM Steamers is popular, not only for its great waterfront views, but also for a menu which focuses on the freshest, in-season ingredients. Both Scotty's and PM Steamers restaurants are considered two of Ludington's best--earning rave reviews for their excellent cuisine and top-notch wait staff. Be sure to visit them for a meal soon. View Scotty's Menu Guide page here. View the PM Steamers Menu Guide page here. Local Museums...Learn About History and More!